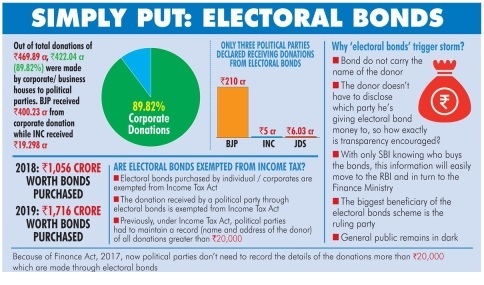 ﻿ Political parties must disclose details of donations received through electoral bonds to EC: Supreme Court. Political parties must disclose details of donations received through electoral bonds to EC: Supreme Court. The Supreme court on Friday issued an interim order directing all political parties to disclose to the Election Commission details of donations received through electoral bonds till 15 May. Names and details of donors also need to be disclosed. All the information has to be provided to the Election Commission by 31 May. Supreme court also directed the finance ministry to make amendments with respect to the extra five days provided in the months of April and May for issuance of electoral bonds by the State Bank of India. The law allows only a 50-day spread in the months of January, April, July and October during which the bonds can be bought. "Electoral bonds have tremendous baring to the electoral sanctity of India," Chief Justice Ranjan Gogoi said. Critics of the electoral bond scheme have contended that since the donor’s name is not known, any shell company can make a donation. Attorney General K K Venugopal had submitted before the court that a know-your-customer or KYC procedure is carried before issuance of these bonds. The Supreme Court bench had made an observation yesterday that the KYC just verified the donor, not the source of money from which donations are made. The Election Commission has stated it will support the electoral bond scheme if the donor's name is revealed.